Stay tuned over the weekend for the rest of this short story, based on our Ben and Pip's superhero persona's! “Go eat your food Jack, there’s a good boy,” said the voice which towered over Jack with a patronising tone from above. Today was a good time of the day for Jack. Well normally anyway but today WOULD be different. Jack paused, and stared at the food. Something peculiar was going on. Something didn’t seem right, somehow. As the owner receded back into its house, this Sprollie knew that something was different about the food. It smelt weird for a start. Jack eyed the food with disbelief. “Cat food”, he muttered to himself. The breeze of the outdoors ruffled his fur as he stood outside his kennel gazing at the sky up above. He then glanced back down at the food and ate some. It was terrible, he thought and certainly not the usual stuff. Something WAS going on, and he thought he knew. It was KITTY NIBBLES! Perhaps... this would remain quite a mystery to ponder. Meanwhile, in the not so distant kitchen, Ben and Pip stood. And then, moments later the “Dog Food” came down in the dishes. It came from the same usual tin but this food was very different. 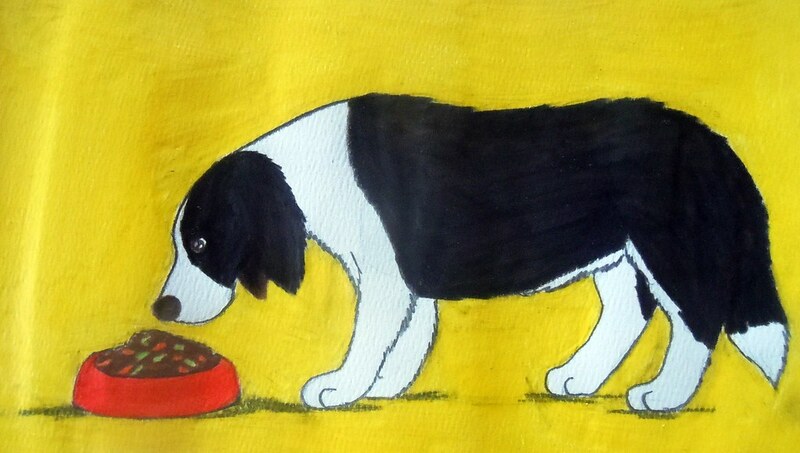 Pip stared at the food suspiciously before eating while Ben, being Ben gobbled all his grub down without hesitation. “There’s something funny about that food. It tastes different somehow,” said Pip slowly. “Really? Tastes good to me, just like chicken. Chicken is goooood,” said Ben eagerly. Those Sprollie senses were tingling. “Maybe, the humans made a mistake,” remarked Ben quite thoughtfully. Pip was interrupted by Ben, who excitedly had found the Kong. Not any Kong, but The Kong. His craziness and excitement could never be contained. Jack walked into the human’s house casually, to find Ben in hyper mode playing with Kong on his own excitedly, while Pip sat on the rug nearby in deep thought. Pip thought this was a fitting opportunity to continue her sentence. “STEAK?! WHERE?” said Jack and Ben at the same time. The thought of it sent drool on the old, beige (and now wet) rug. “It’s a bit like that, em, what’s it called...” He pondered for a moment. “Kitty Nibbles! Yes, that’s it!” He burst out suddenly with pride. Ben listened carefully. This story could be worth remembering. “OK... I think we smell an investigation coming on-” said Pip. All three dogs then decided to go for a relaxing stroll on this great sunny day. 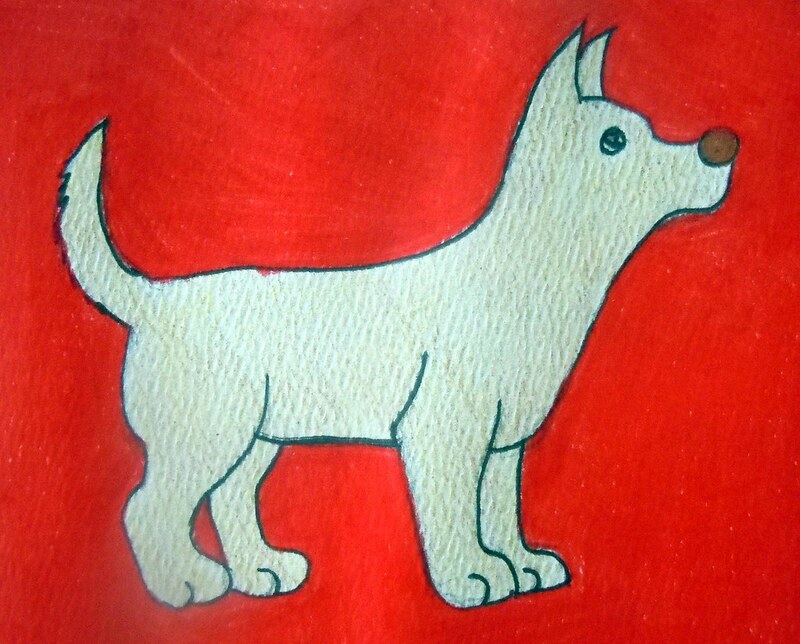 The sun shone brightly over the evergreen grass of Greenhill and reflected on the dogs’ coats. Then they saw something approach them. It was a small dog. A cream Chihuahua. She looked mysterious somewhat but friendly. Gosh, I am the edge of my seat! What's going to happen? P.S. : I kind of like cat food, but don't tell anyone! We are quite intrigued by this adventure. We don't know what kitty nibbles tastes like, but it sounds like maybe we won't like it. Great drawings. Can't wait for the rest of the story. I can't wait to hear what happens! You got us hooked, can't wait to hear more. I had quite a similar experience. My dog and my cat mixed up their food. My dog was eating cat food and the cat was eating dog food. Is that normal?